The late, great, master artist Bob Peak used many medias and techniques to capture his artistic vision. If you’ve seen his work in person, you know how rich the color, how spectacular and innovative his lens flares were. Then there is that style, that chameleon like style to be able to jump from genre to genre without blinking an eye. All of these in master works created for over 4 decades. Bob was also a master of nuance, the shading, the light in his works, created a depth and detail that are all the things that draw us in and convey volumes. 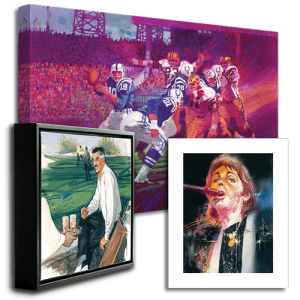 When we started to think of offering Bob Peak reproductions, our first priority was to create a product that would be up to Bob’s standards. Which brings us to why we use the fine art printer that we use, and how we found them. Seen Robinson, webmaster and shop owner, has 25 years in the art world as a designer and art director. He has worked with and consulted art galleries that use the highest quality Giclée reproduction studios in the country. So, when we wanted to reproduce the Bob’s work, we chose from the cream of the crop of printers. We tested them to see who would work out best for the types of products we wanted to offer, Canvas and Paper Giclées. We tested a variety of images, from Madonna to Spock, from Advertising to Western to Fine Art, with different printers here in the United States. Happily, we located a printer who has the experience, and an impressive resume of clients, who include Disney, Thomas Kinkade, Marvel and many more, including some of the most respected artists in the industry. The prints you buy should be be as close to the original as possible. Quality is still our top priority. Every detail is important, even the tightness and finish of the canvas wrap. Our reproductions are identified by a unique stapleless, wrap-around, stretching method which is unique in the industry and gives the final product a complete and finished, ready-to-hang look. Which brings us back to the legacy of Bob Peak. 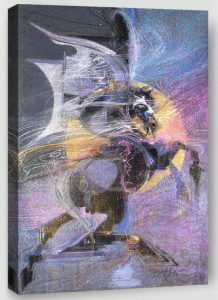 Throughout the process we have worked with Thomas Peak, Bob’s son and author of The Art of Bob Peak and The Drawings of Bob Peak, which are considered to be the gold standard of Bob’s canon. Tom’s standards are incredibly high and we made sure that he was not just ok with the samples that we created, but he was blown away by the quality. Tom gave us his full blessing to provide his father’s work to people who know Bob’s work intimately. We know that those who know Bob’s work have an incredibly discerning eye, so we all wanted to make something you would be proud to showcase in your home. Here are a few specifics on the quality of the reproductions we offer. We use a medium-textured 100% cotton 8oz canvas, double primed with acrylic, acid-free gesso. After the canvas is printed with eco-friendly inks, it is finished with a UV coating. All of these steps add up to an archival, museum-quality piece that will last generations. Our canvas is folded at the corners and is splined, resulting in a tight, even stretch. We use the tuck-n-roll stapleless method which uses a rubber spline pressed into a groove running through the back of the stretcher bar frame. The canvas can also be disassembled and re-stretched in the future with little trouble. All of our floater frames made from 100% recycled material. 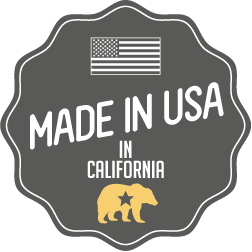 They are manufactured from products recycled in the U.S. and the manufacturing facility is based in California. We are very proud to be doing our part for the environment while creating a beautiful product. Our floater frames have a smooth and uniform finish ideal for all kinds of art. Every piece is made when you order it, at a small plant in Southern California. We ensure your products are packaged in a way that protects the investment inside. All of our reproductions are packaged and handled with care, then shipped via FedEx to ensure you get your package as ordered.